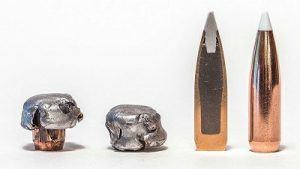 33 Nosler 225 Grain Nosler AccuBond- Like the .26, .28, and .30 Nosler cartridges, the new .33 Nosler is loosely based on the fat, beltless .404 Jeffery case, beefed-up to handle SAAMI-approved pressures of 65,000 psi. The .33 Nosler embodies current case design concepts thought to promote efficiency and accuracy. The sharp, 35-degree shoulder and fat case offer a lot of room for propellant, and the maximum cartridge overall length (COL) of 3.34 inches means it will fit in a standard .30-06-length action. The new 33 Nosler is one of the more advanced cartridges to hit the market it quite some time. 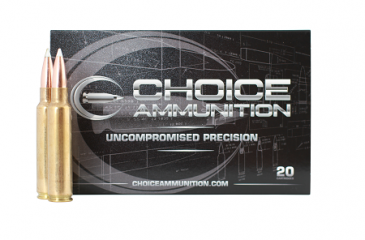 Choice Ammunition has taken our 100% hand-loading techniques and produce an extremely accurate, highly dependable round for the 33 Nosler in this load. Our loading tolerances are only matched by passionate hand-loaders in their own loading rooms. Consistent seating depths, powder charges and proprietary formulas of Choice Ammunition, make this 225 grain Nosler AccuBond round the best you can buy on the commercial market today. Through an exclusive bonding process that eliminates voids in the bullet core, AccuBond couples Nosler’s proven copper-alloy jacket with its special lead-alloy core. The result is a bullet that flies true, penetrates deep and retains its weight, without causing extensive barrel fouling. The unique white polymer tip resists deforming and initiates expansion on impact. Nosler’s Solid Base at the rear of the bullet acts as a platform for large diameter mushrooms.